JT and I tried to get some volunteers hours in Thanksgiving AM with the first annual Lost Our Home Pet Foundation’s Turkey Trot. First we walked two min-pin looking chihuahua mixes, Simon and Minnie and then took a short spin with Shadow (who had already been on a mile and half walk but was still so wound up that we were afraid he might get away from us – that boy was strong!) When we got home, Shenanigan could smell we had been visiting other dogs, so we took him on a nice long turkey trot too. Once we had our good deeds behind us, we lazed around the house and did some of our cooking prep. JT was in charge of the turkey and I had tasked myself with some vegan side dishes. The stuffing was easy – Stovetop (cornbread version) from the box made with vegan margarine (no different from real margarine – super processed and pretty gross to eat plain but at least they offer a soy free version), a veggie dish and the cranberries. For my veggies side, I made a roasted brussels sprouts and cinnamon butternut squash dish with walnuts and dried cranberries (recipe here). I’m usually not a fan of sweet and savory together but this really works and I’ve made it a few times now, all to good reviews. The cranberries were something my dad would always make for family gatherings in Iowa. I remember packing the food processor, bag of cranberries and oranges in the minivan for the schlep. I don’t know that he had a written recipe he followed and I’m also pretty sure his had gelatin in it, so I’ve found a veganized recipe that still holds on to what I liked best about his version – the freshly grated cranberries and whole oranges (even the peel – recipe here). In place of the gelatin, this recipe simply uses sugar (I toned that way done if favor of a more tart recipe) and raspberry jam. I had an organic superfruit jam blend that also had cherry in it, really good. My mother-in-law and her husband brought the rest of the feast with them, including a “wacky” cake for dessert and we were all set. I love setting the table for nice meals. This year I used a white flannel sheet I had bought at Goodwill’s half off day. It was much less stress of worrying about wine or cranberry or anything else that might get on the table. The napkins are the embroidered “T” napkins we used at the head table at our wedding, almost twelve years ago now. The table runner was an impulse buy at Target and I think it is a Nate Berkus design. It had a really ugly black tassel on the ends that I removed as it was too harsh of a contrast between the white, light grey and silvers. I am thankful for a lot in my life but I do have to say how very thankful I am for our old dog Shenanigan. He is so sweet and calm and sometimes silly and he brings so much comfort to our lives. He was happy to see his grandma but also happy to lay on his “pillow cloud” in the corner and hang out with us all evening (one of the dog beds is usually under the table but since we had the tablecloth on, I added it to his pile.) His face is almost all the way white now and his fatty tumor is so big that people ask if he is pregnant and I know our time with him is growing shorter every day. We’re trying to enjoy every last drop. We have been on the fence for a few months now about adopting another dog. After losing our beloved Sophie earlier this year, we didn’t want to rush into anything and we definitely didn’t want a rebound dog. But …. life with just one fur baby didn’t seem quite the same and Shenanigan seemed mopey and under-stimulated. He began to be very finicky about eating and we were worried about him. So, what could be the solution to all this? Rebel! We adopted her from Lost Our Home Pet Foundation (her name was originally Wilma). I had started volunteering there a few months ago and she seemed too timid to last long in a hectic shelter environment. I’ve always had a thing for the shy guys, the ferals or the almost-ferals. It turns out Rebel is an almost-feral because once we got her home, she was terrified of the stairs and any new noise (the TV) or movement (the sliding door) seemed to shrink her into herself a little bit. 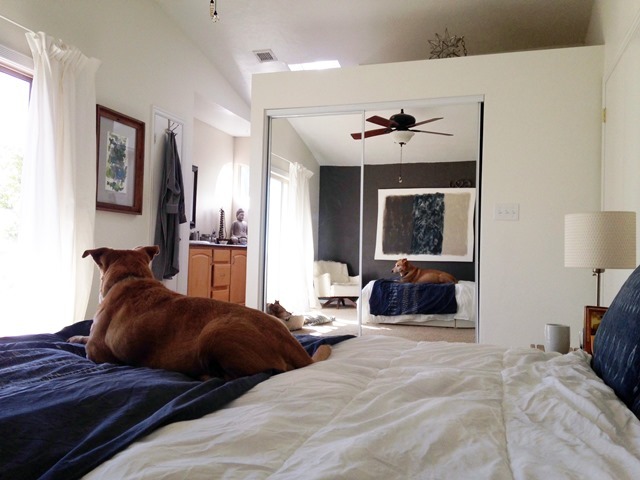 She thought her reflection in the mirror was alternately a friend or an enemy. Our solution worked for Shenanigan though – he’s been playing with her a little bit (which is actually a lot for him, he was afraid to play with Sophie as she could be kind of rough) and exploring the yard a lot more and eating all his food – it’s like he is showing off for his new little sister. As I mentioned in the last post, I foresee some changes happening to this room as it has started evolving more rapidly since the addition of the area rug. The paintings are still safe for now but JT and I have discussed a re-do. (He’s on board, gotta love that guy.) Instead we had an out-of-the-blue, spur-of-the-moment, why-the-hell-not ottoman makeover project on our long Labor Day weekend. If your eagle eyes can read that Goodwill tag on the ragged corner of this bonded-leather beauty, you are correct that it says $5.99. And don’t forget – it was half off day! So this ottoman only cost $3.00! Not quite because we still had to purchase fabric as I wasn’t keeping it in THIS condition but not too shabby. While we still had “the thing” penned up in the back of the truck and airing out from the eau-de-Goodwill, we stopped by Joann for the next purchase. JT was definitely the only man in the store and he marveled at the size and quantity (and need for) so much crafting stuff. Or maybe he was more perplexed than marveling. Your call. We found this great Nate Berkus fabric that should have been $45 for our three yards but we scored for $22.50 thanks to a major Labor Day sale. So let’s bring our ottoman price up to $25.50 and call it good. I also bought the buttons shown in the picture above but decided once I had the thing upholstered that I didn’t want them. Then began the disassembly process. JT tackled the much-abused base with some Restor-A-Finish we had on hand from the Danish Daybeds. I removed a percentage of the staples (especially around the corners where I knew we would need to be adding more staples back in) and the black tack fabric to remove some bulk. We left the bonded leather in place and cut the tufting buttons free from the inside of the frame. The fabric cutting and sewing process did not get photo documentation but took the span of about five Friends episodes and ended with a locked up sewing machine about one inch from the end of the last seam. I need to take the machine in to get oiled and serviced, it’s probably about time. Once the bottomless cube was (imperfectly) sewn up (and please note I was careful to choose a fabric that would disguise my low seamstress skills), it was time to stretch that baby onto the (heavily Febreezed with my own homemade concoction of vodka, vinegar and lavender essential oil) base! We used our trusty Stanley staple gun with 3/8″ staples and pounded in any stragglers with a hammer. The staples didn’t have any trouble going through both our new upholstery and the bonded leather (or vinyl?) so I’m glad we didn’t go to the pain of removing the original material. I included the last picture above to highlight JT’s drill bit extender – this has come in really handy when you need to attach screws in a deep pocket like this frame had. And the afters! We’re loving it and definitely changing out our paintings to get rid of the mossy greens and clay colors. And that wet bar … I’ve got my eye on that catch-all-junk, 80s eyesore of a wet bar. There’s starting to be a lot of pattern going on in this room and we considered going with a milder ottoman fabric but we figured for the price we might as well “go bold or go home” as they say. Then I styled it up with a tray I had on hand and some of the items that were living on the coffee table before. 2016 has started out as a year of change – gradual or sudden, they keep bursting upon us. In January we had our Sophie girl with us and now in February, we do not. In January we had David Bowie with us and in February we do not. The same transition has happened to my grandmother with the loss of her second husband a week later. In February we marked the twelfth year since my father’s untimely passing. It’s a disappearing act, one day they are here and the next day they simply are not. Their memories and mementos lingers and you expect to see them around every corner you turn. 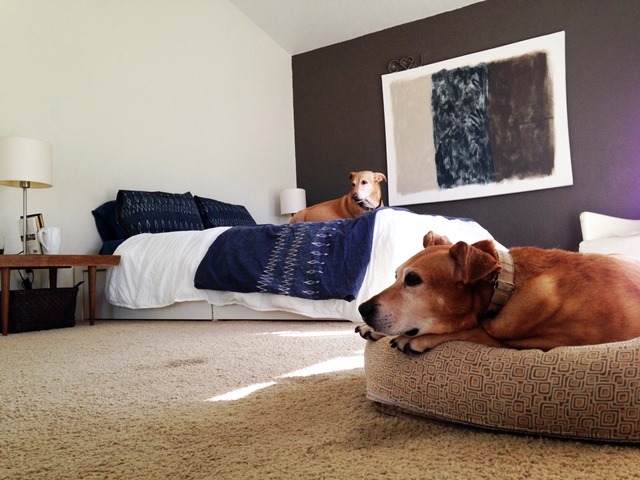 Our pets are our daily companions and they give back an unselfish love every moment you spend with them. 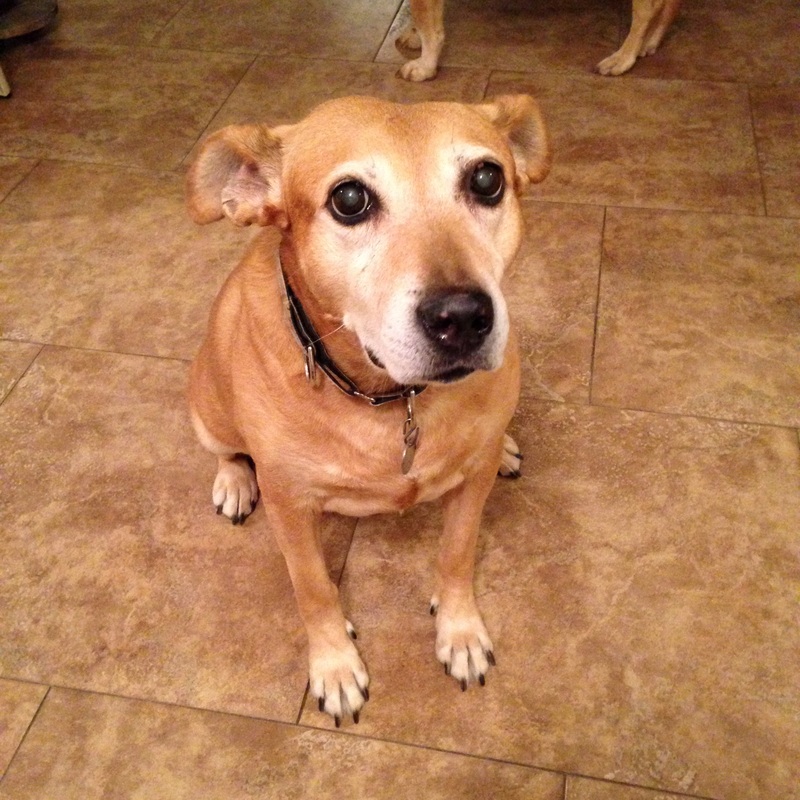 With Sophie the dog’s passing, we feel it acutely and forcefully. We were her earthly guardians and ultimately also the acting agents in her leaving this earth. We willfully summoned the vet to our house and paid for her release with the doses of sedatives and drugs that stopped her lungs and heart. In our defense, we were doing this to save her from an unnecessary suffering – a silent cancer had invaded her liver and spleen and rotted out her insides long before she showed any outward sign, brave girl. In some ways, I think we are more humane to our pets than we choose to be towards ourselves when it comes to this end of life juncture. I think that Sophie had a good life, for a dog. We were newlyweds, living in a 400 sq. 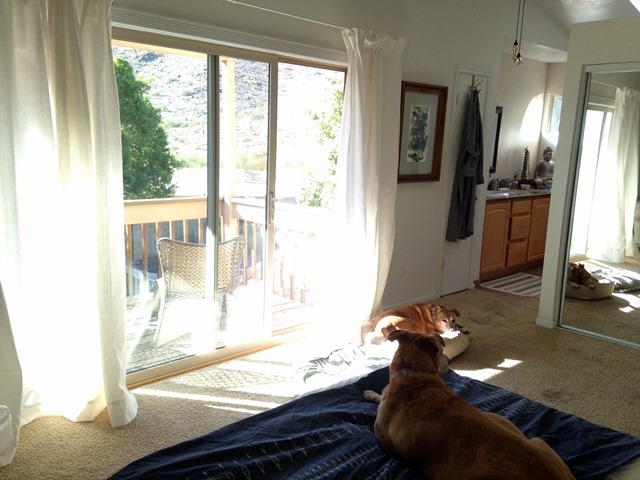 ft. second floor apartment with one dog already who was just outgrowing puppyhood – it made perfect sense to get a second. (Sarcasm). But I just knew we needed another to make our little family unit complete. So I searched online and we visited one sweet pup at the APA that wasn’t “the one”. And then I saw Sophie’s rescue story on Stay Rescue’s site and saw a resemblance to Shenanigan and such sweet, loving eyes that I knew that she was ours. We put in an application and her foster parents brought her out for a visit. She gravitated towards JT, giving him big eyes, seeming to know he was the one she had to win over. I still remember her in the backseat of her foster parents’ green sedan, ears high, looking out the window at us as they drove off after the visit. We talked it over and decided to try it out and her foster parents seemed to know that despite the second floor apartment and being young and naive that we would love her forever and so it was a match. It wasn’t without its difficulties – Sophie came to join our family in our snug little apartment next to the Botanical Gardens and we learned that her past abuse made her nervous to be on a leash and especially be on a leash near other dogs. But we didn’t have a yard for her to run in and so we’d wander around our little South City neighborhood trying to get her to do her business, only to come back in the house and find that she had snuck off to pee in a corner. We tried joining a dog park to see if the off-leash experience would be better but she made such terrible noises when the other dogs played that it sounded like she was alternately murdering other dogs or being murdered herself. So we did what rational people would do and bought a house before the first year’s lease had even expired on our apartment. As Sophie learned to trust us and with a yard for early morning potty runs, she grew to be fine on a leash and we were able to take her many places. Other things would pop up, like a brief period of chewing plastic things (the remote, the camera, my phone), an intrinsic fear of the “windman” and an unhealthy high alert stress reaction to small children. We learned to take it in stride, listen to what she was trying to tell us and be sure to keep her out of stressful situations. She’d already been through enough. In exchange for a roof over her head and a back yard to pee in, Sophie was so sweet and loving. She preferred to be around people and never fully learned to be a dog – she didn’t play with toys at all. She loved bones though – we found one Nylabone-type thing with the end all the way chewed down and we worried she was sharpening a shiv for an escape act. Although I doubt she would have ever tried to escape at all. I fell down once while walking the two dogs after tripping over an uneven joint in the sidewalk and Shenanigan ran off to sniff everywhere he could, unconcerned with anything except his sudden freedom while Miss Sophie came to check on me and make sure I was okay. That was her way. 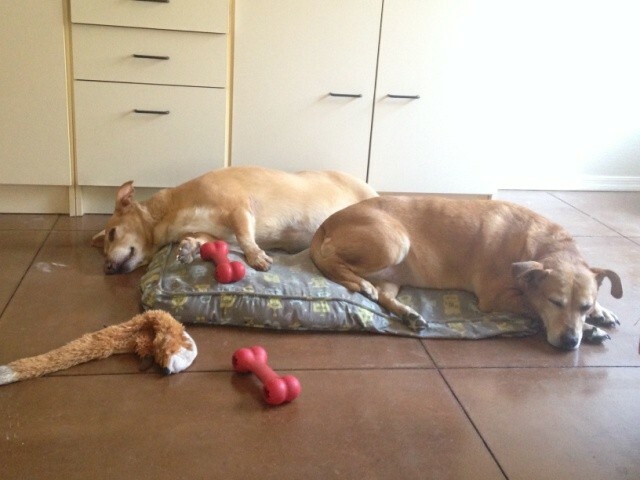 The two dogs had a deal – Shenanigan guarded the house and Sophie guarded her people. She entertained us a lot – when she got excited about going for a walk or something she would “moo” and we always thought someday we could teach her to say “I love you”. Every morning after she ate her breakfast she would “wipe her face” by rolling around hilariously on her back, her big white belly in the air and her little feet kicking everywhere. 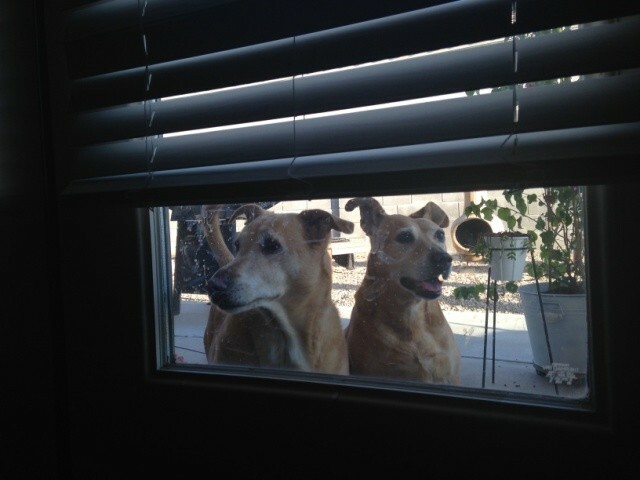 Phoenix seemed to agree with our dogs. My mom and I drove them down here in a two day exhaustion-fueled driving tour (JT was already here for work) and they seemed content to sit in their dog beds in the back seat and watch the midwest slowly change to the southwest outside the tinted windows. The weather here, so warm and dry, seemed better for their joints and Sophie especially seemed less arthritic and more relaxed. Her face had turned from tan to all white so gradually that we didn’t fully comprehend what that meant until it was upon us. We worried that they would miss the grass in this land of rocks and dirt and made sure to walk them to the nearby park or green space for a chance to roll around in the green stuff. Her last day came when I was in St. Louis on a very short and stressful work trip. I didn’t want to be away from home but I didn’t have any other option. We landed and I got back in contact with JT. He let me know I needed to get home. I think she was waiting for me. 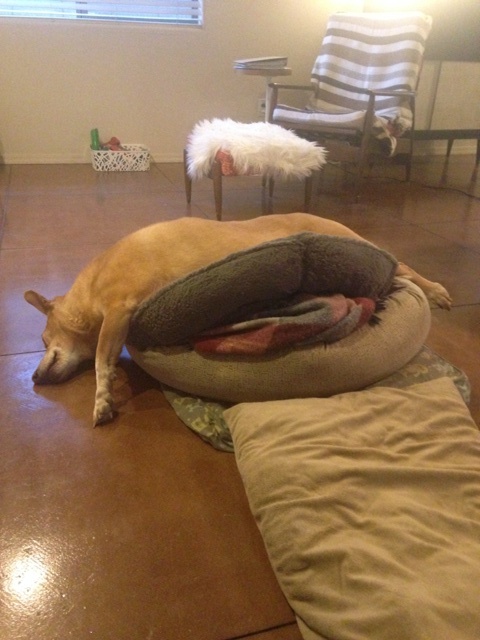 She wagged her tail but was too weak to get up. I laid down on the floor besides her and she stretched out along my body. I told her how much I loved her with my eyes and she huffed an acknowledgment, breathing my breath with her breath. This and many more wordless communications of affection and love I will hold with me always. 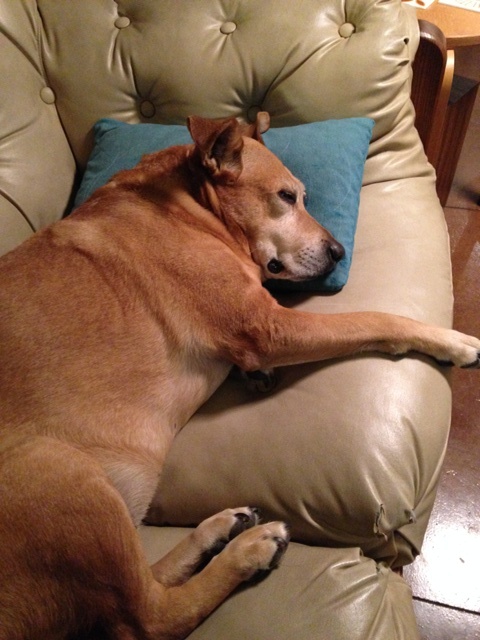 Writing and re-writing all these past sweet and stressful and silly times with my old girl has tears streaming and maybe this eulogy of sorts is too long for a dog. It seemed like it needed to be written. All I know is we miss her so much. And I’ve learned enough about grief to know that that’s okay. PS – After all of these transitions, I read Paul Kalanithi’s “When Breath Becomes Air”. It was partly because I’ve been reading Joanna Goddard’s blog A Cup of Jo for some time now and I was heartbroken to hear of the family connection (her twin sister was married to Paul) but also because I think we sometimes avoid the subject of death and dying and yet it’s so omnipresent. In the space of time since I started this blog post and publishing it, one of my sisters has also lost a significant person in her life and my heart goes out to her. I’m glad February is the shortest month. 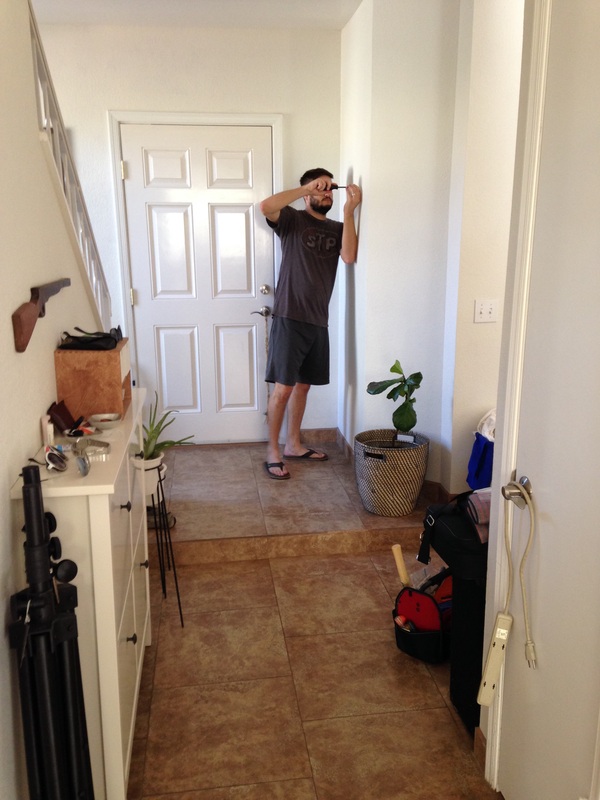 Before we moved in, we painted the bulk of the first floor Benjamin Moore “White Dove”. We stopped the paint at the corner at the bottom of the stairs before it turns and goes up into the two volume space. So for a while, downstairs was gorgeous gleaming white and the upstairs was still that dingy, fleshy beige that drives me crazy. We have nice high ceilings in this room and so we decided to accent the end wall with Sherwin Williams “Porpoise” which was a color we had in our STL house as well. I guess I just really love that color – it’s a pretty perfect warm dark grey. The canvas artwork has moved with us too and lived in a few different rooms before ending up here. I have a love/hate relationship with the mirrored closet doors. They’re so functional yet so …. tacky. They do help bounce the light around the room. You can kind of see in the reflection that we have the Koehler white vinyl rocker/lounger in the corner for a little sitting/clothes piling area. JT got that chair from Goodwill during college and I think we may have it forever. I love it – there’s nothing tacky about it! You can kind of see beyond that the master bedroom opens into the sink area of the master bath and then around the corner and behind closed doors is the water closet and a large tub/shower. Here’s an outtake from my little photo shoot – Shenanigan was done with being photographed and wanted O-U-T of the bedroom. Tough luck little dude. 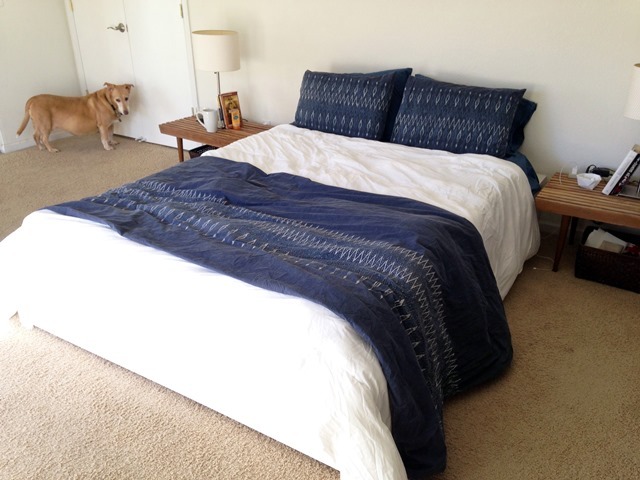 The blue duvet cover and pillow shams came from West Elm about two years ago. Next steps for this room is a proper headboard – we still haven’t had one of those in almost 11 years of marriage! It would also be nice to upgrade our bedside tables and lamps as well at some point. Above is a little scene from this A.M. – Boo got scared of something in the night and jumped up on the bed. 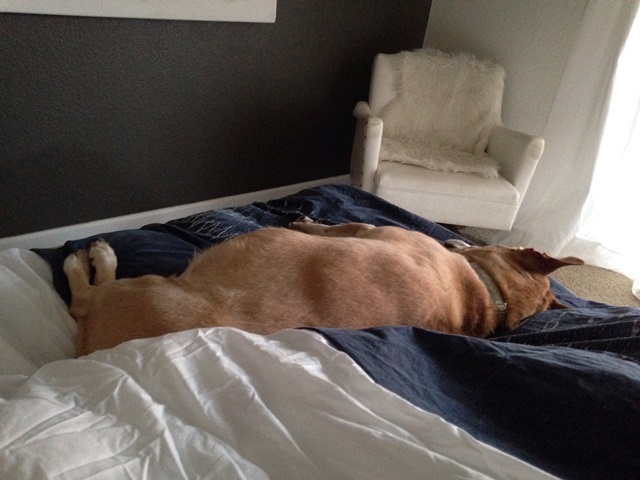 The dogs are getting older with creakier joints so they actually don’t get up on the bed with us as much anymore, which is probably good for both the husband’s and my back. 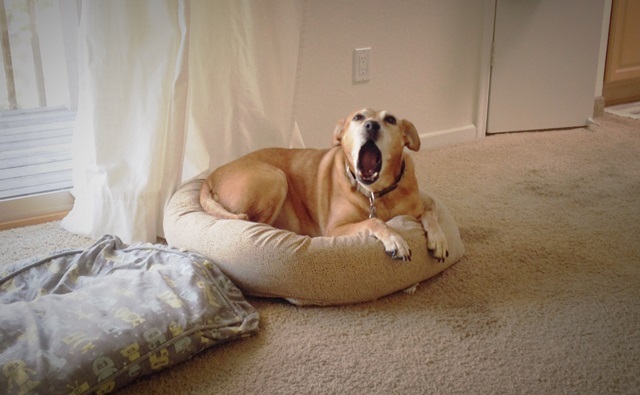 Not to be left out, I also caught Sophie the dog mid-yawn this morning. You can see how the carpet has some Sophie spots on it. JT and I would love to replace the carpet for hardwood or maybe an LVT floor as Miss Sophie has left her mark a few places when she wasn’t feeling well with a UTI. We’ve rented a steam cleaner twice but haven’t had any success getting fully rid of the telltale stains. The best part about this house and especially the master bedroom is the view – there’s a balcony looking out over the mountain. We picked up some cool chairs from Lowes and JT and I sit out there some mornings, sip our coffee and soak in the scenery. Below is a better view out the sliding door and over the balcony. 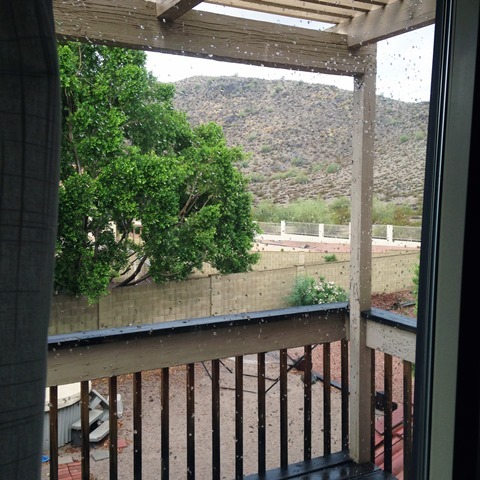 It was a rare(r) rainy day the other day and like a true Phoenician, I took a photo of the rain. You can kind of see the hot tub below on the left and the hammock is hanging out down there. JT has been itching to find some pavers and fill in the large “sand box” we inherited and create a nice outdoor living room. So that’s the master bedroom in the new house, a little sanctuary in the sky. There’s still work to be done in there (we need a non-ugly fan STAT!) and I didn’t show more photos in the bathroom part of the suite on purpose – it’s a work in progress but we’re loving it. After another trip around the blazing hot sun (it was 104 degrees here yesterday on the first day of October!) JT rewarded me with something I have had my eye on for a while now …. 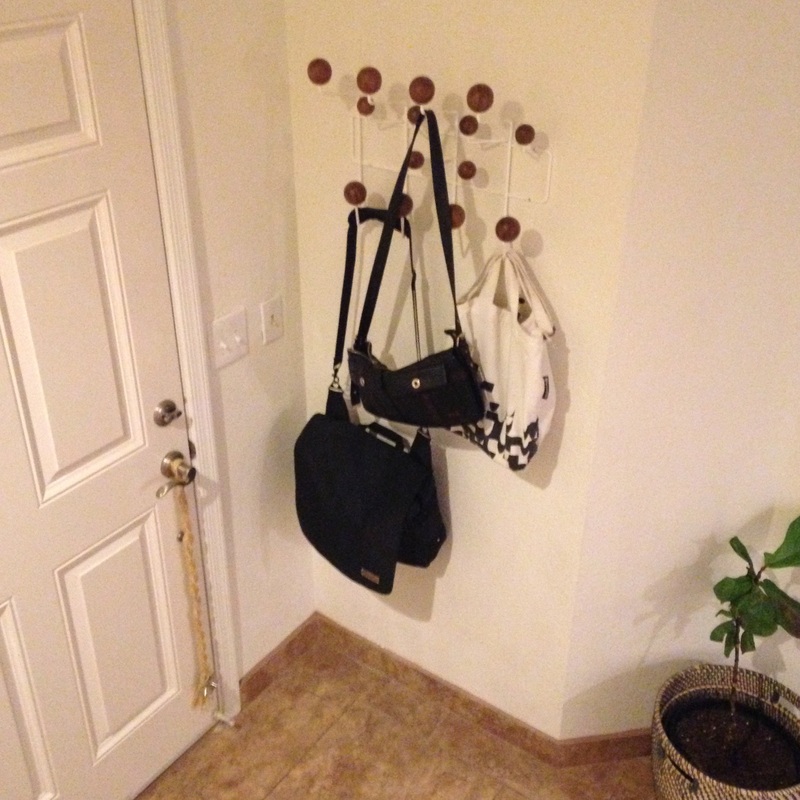 an Eames Hang It All! Husband is actually very smart and lets me self-select most gifts as I am ridiculously opinionated on all things that live in our house. He did also surprise me with flowers at work this year, bonus points husband. 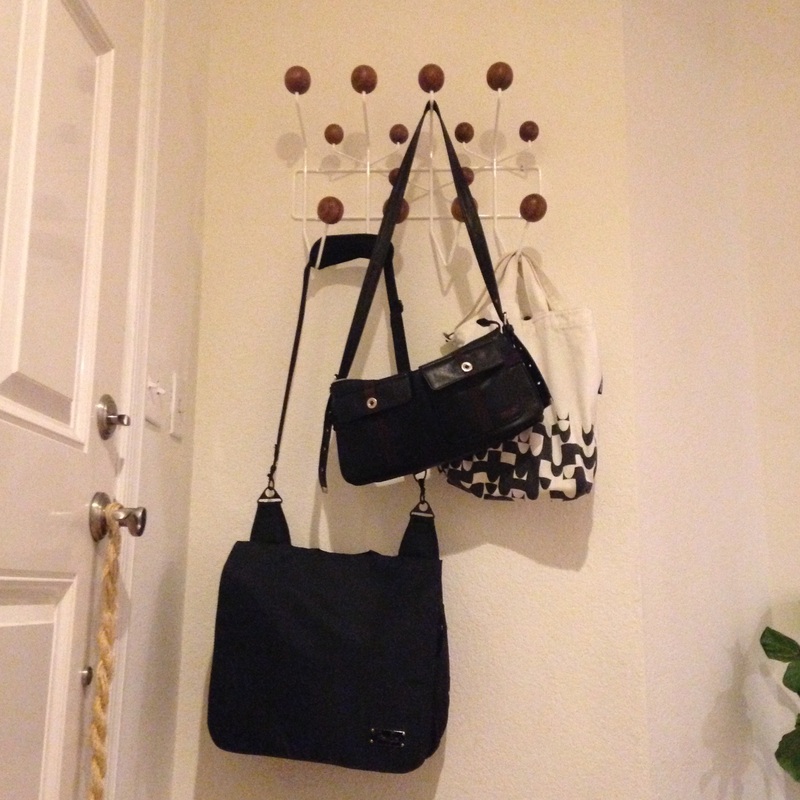 Back to the Hang It All – is it a little overpriced for a coat hook? Sure. Do I love it and want to keep it forever? Yes please. – Also for my birthday (did I mention I’m pretty spoiled?) 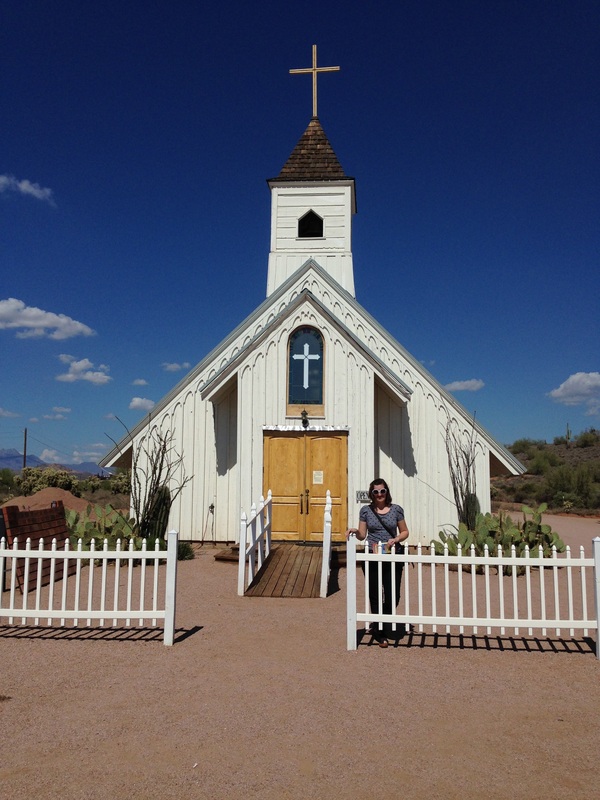 JT and I took a weekend road trip to southeast Arizona. We visited Tombstone for a few hours (that’s about all the touristy time we could handle) and stayed the night in Bisbee, which I really loved and reminded me of the American West version of Portwenn in Doc Martin but far and away the highlight of the trip was the winery region around Sonoita. It was so beautiful and there was some good wine. We are going back and hopefully soon! The high desert is amazing. 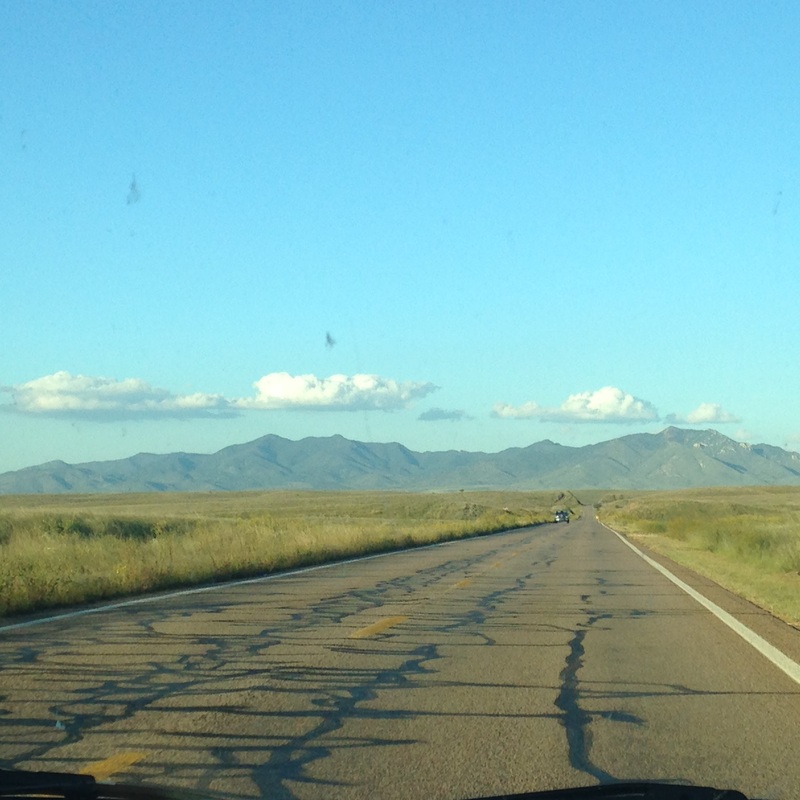 I took this picture from a moving car while driving east from Sonoita towards our hotel in Sierra Vista. Amazing views for miles and miles. And – five years late I joined Instagram. I posted the above picture up and was proud to add the hashtag #nofilter! My Instagram handle is ct.livinganalog. I’m hoping to use Instagram to help me get my photos out of my phone more and into an actual printed form. If anyone has some good recommendations for Instagram prints, I’m all ears. – JT made me a log table! We had a tree crew come and cut down a dead and mostly knocked over tree as well as the tree at the back most corner of the yard. Couple that with our backyard neighbor getting their tree (excessively) trimmed due to aggressive hybridized “killer” bees, and things got kind of bare in our backyard for a while. The quail all quit us for a little bit but we got a huge bird feeding block from the hardware store and now they’re starting to come back. 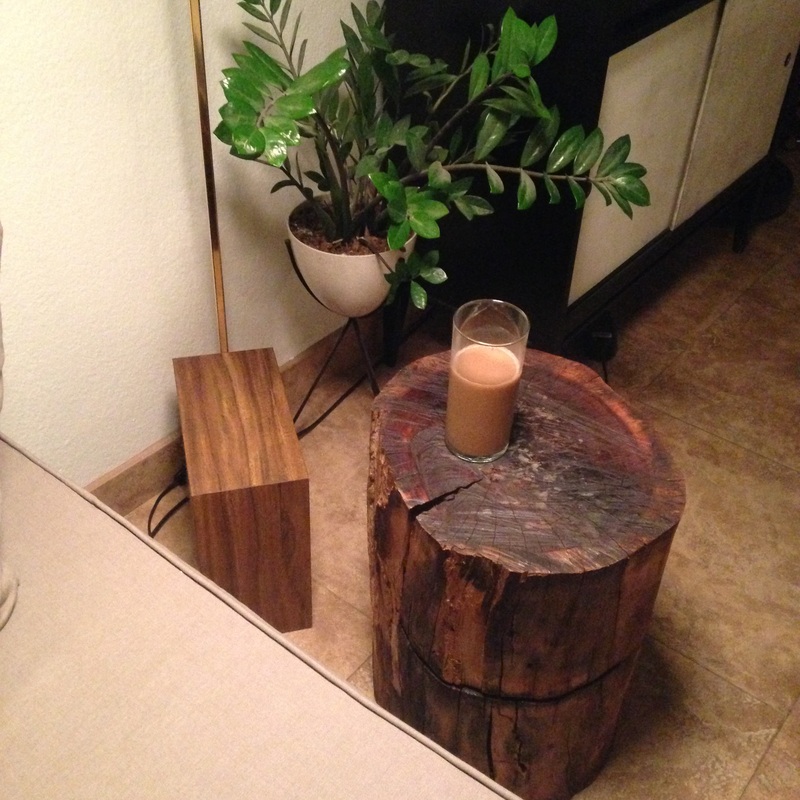 JT will have to do a proper post about the log table but it’s been a great addition for the living room – perfect for holding a beverage and just looking cool. – There have been other, more terrifying bugs than the hybridized bees around … I found this THING in the garage the other day, words don’t even do it justice. 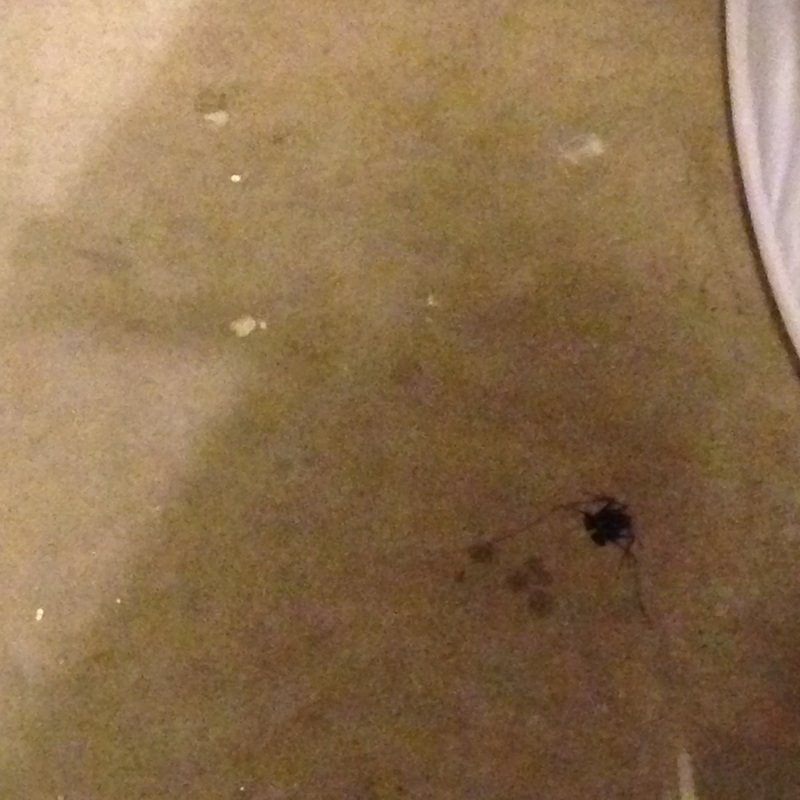 It appeared to be part large black spider and part scorpion or crab. It was waiting for me at the door from the laundry room to the garage (it was inside the garage though, not actually in the house). I was too terrified to get a picture of it while alive and the dead picture doesn’t even show what it could be but here goes …. The body part of the creature was about the size of a quarter and then the legs when out from there …. I hope I never meet that bug’s mother. I think it was an alien. – We’ve been taking lots of little trips and one big trip (to Portland!). 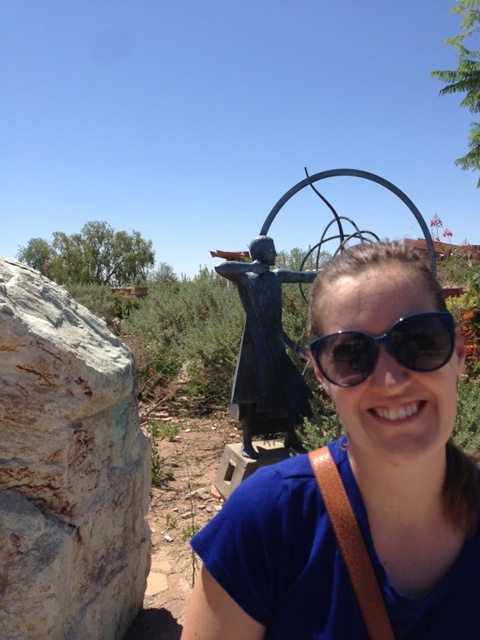 We’ve been traveling around Arizona and camping and staying as many places as our three day weekends allow – Payson and Lake Pleasant and Tucson, Jerome, Prescott and Apache Junction. We’ve driven to Las Vegas from here once (it’s about 5 hours and you go through about 5 different types of environments – even a Joshua Tree forest). Driving in Arizona is fascinating and terrifying because once you get out of the valley, the scenery is breathtaking but the roads immediately become steep, winding and full of tractor trailers going too fast. 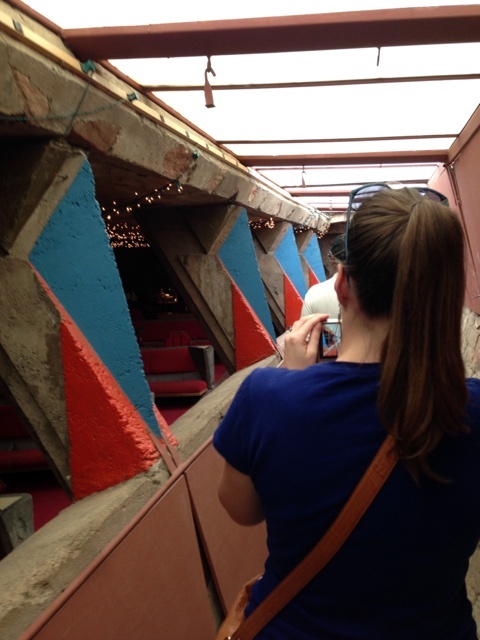 Above is a snap from one of our jaunts – the Elvis Chapel at the Superstition Mountain Museum. Yes, Elvis (or a non-lifelike replica statue) was inside. Yes, my sunglasses are too big for my face – look at all that sunshine! A girl has to take cover where she can get it in this state. Portland (Oregon) was so amazing and such a great respite from the heat we’ve been plodding through. I’ll do a better Portland recap in my next post. 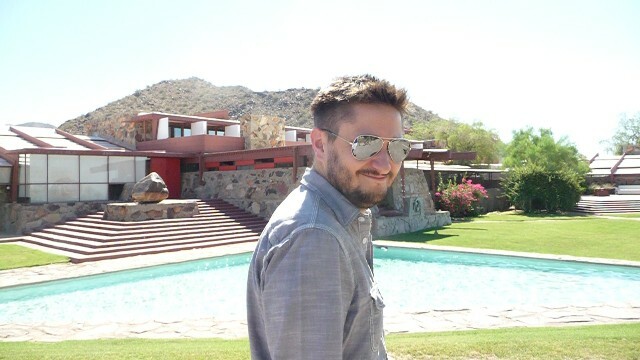 I loved it there and I could easily see doing a 6 month split with Phoenix – live in Portland for the 6 months of summer and Phoenix for the 6 months of winter. Now I just need to find a job that will let me telecommute like that ….. I hope all is well with my interwebs friends! I’ll be around more and I hope to catch up with everyone. Has anyone else noticed how Jimmy Fallon always comments that there is a “hot crowd” now that he’s on the Tonight Show? And so the crowd cheers louder because he may be saying that they’re physically attractive but really he may be commenting on their general liveliness? Well (to transition this thing over) we’re always a hot crowd here in Phoenix now that the days are mostly in the 100 to 100 degree range. It’s like a long-standing joke on us (until September when we then laugh at the rest of the country). 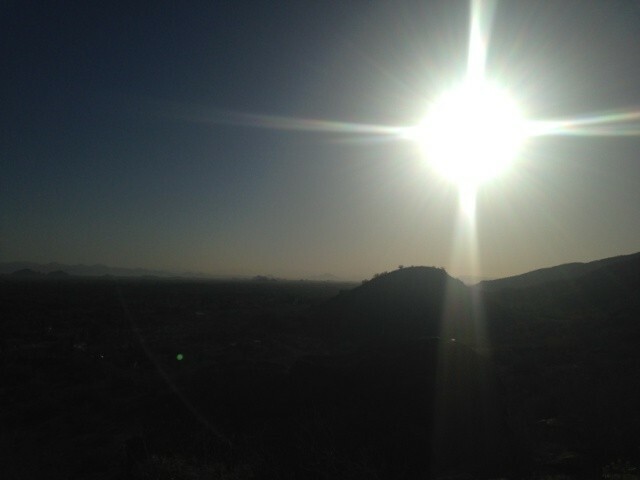 We got up early a few weekends back to see if hiking was still feasible in this heat. 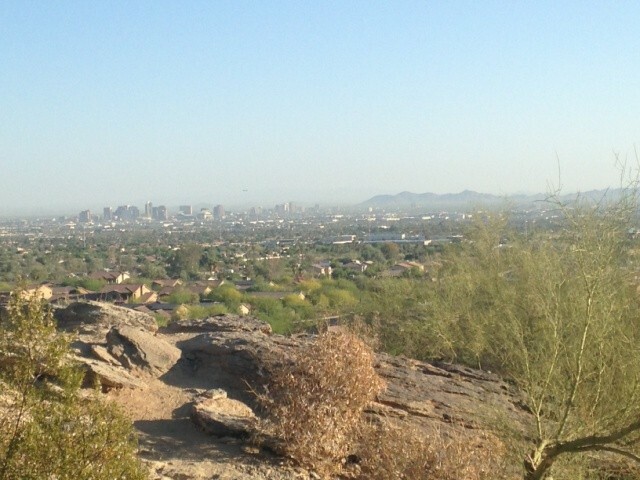 The Valley had a layer of smog when we were only 20 minutes in and not very high up the mountain. The sun started baking us and we called it a little early to head back home, drink all the water we could find and generally lay about. The heat means I open the doors to send the dogs out and in a few short minutes I see this out the back door . 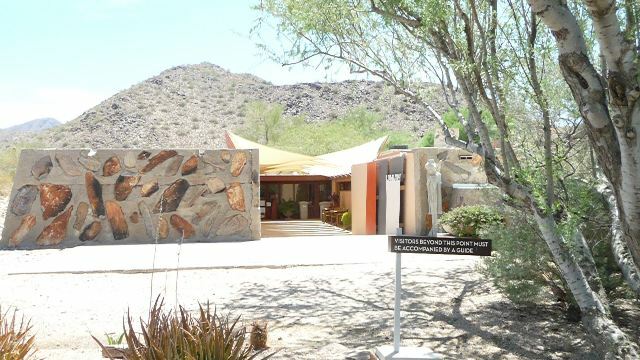 . .
One benefit of the heat is a 50% discount offered to Arizona residents for visits to Taliesin West. JT and I thought the first tour on Saturday morning (9am) might be nice and empty but it was packed instead. So it was a little difficult to take pictures due to the throng of fellow architecture enthusiasts we were surrounded by. The tour was interesting, the sun was hot and I enjoyed nosing around. 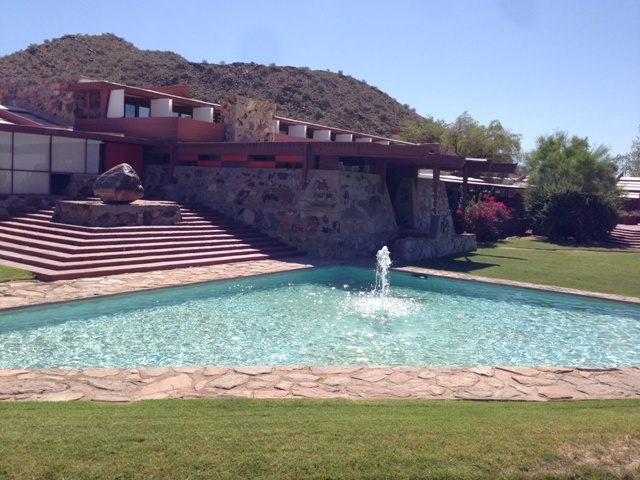 As this was Wright’s winter home, he left a lot of the structures open with only canvas as a covering for a few years until his wife convinced him to go with glass. 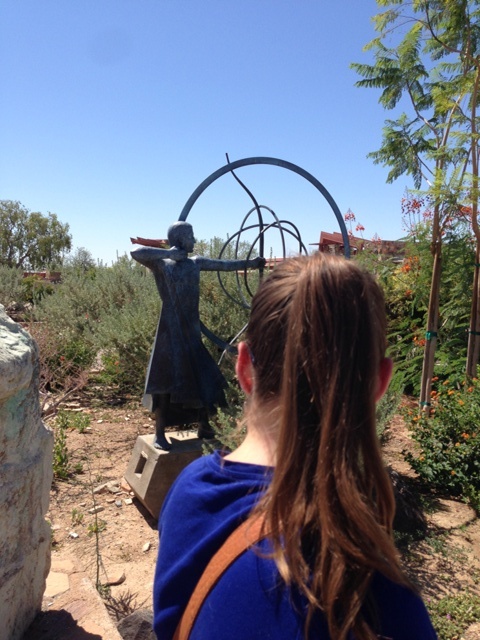 A sculpture I liked . . .